If you check out the Philadelphia Eagles' haul in the 2017 NFL Draft, you'll find that none of the Birds' selections fared particularly well at the NFL Combine. First round pick Derek Barnett, for example, was not a favorite among some fans for his lack of elite athletic measurables. As you can see above, Barnett did not have a good 40 time, vertical jump, shuttle time, and he got labeled as a guy with T-Rex arms. After watching his rookie season play out, Barnett clearly looks like a legitimate starter in the NFL, because he's a good football player, as you all saw. The NFL Combine is a useful tool for player evaluation, and some teams put more stock in it than others. After his first draft with the Eagles last year, it would appear that Joe Douglas values on-field play over the "underwear Olympics." Barnett, Rasul Douglas, Donnel Pumphrey, Shelton Gibson, Nate Gerry, and Elijah Qualls all had disappointing Combines a season ago, and they all ended up on the Eagles' roster. There were some poor Combine performances this week that will hurt players' stock heading into the 2018 NFL Draft. Let's take a look at five of them who could fall to the Eagles as a result. While his yards per catch are lower than a number of other wide receiver prospects in this upcoming class, on film Ridley is a smooth, athletic receiver worthy of being a first round pick. At the Combine, Ridney ran a good 40, but everything else stunk. Ridley's poor Combine could potentially push him down to the tail end of the first round. The ex-Bruin was gaining momentum as a possible top-40 pick prior to posting a slower-than-anticipated 40 time (4.50) that will raise some concerns about his ability to play the role as a vertical threat on the perimeter. Although that time is not pedestrian by any means, it just isn't the kind of explosive figure that catches the attention of coaches and scouts, particularly when Lasley's position workout was loaded with bobbles, drops and double catches. Lasley had a breakout season in 2017 when he caught 69 balls for 1264 yards (18.3 YPC) and 9 TDs, serving as Josh Rosen's deep threat. There are also character concerns with Lasley, as noted in his scouting report on NFL.com. If teams are scared off by Lasley's disappointing 40 time and his off-field concerns, the Eagles could find good value in him in the fourth round. Brown absolutely bombed out at the Combine. His spider chart is a nightmare. Earlier this week, I named Brown as a possibility for the Eagles' first round pick. I would officially like to distance myself from that as soon as humanly possible. But if he fell to the fourth round? Sure, go get him. 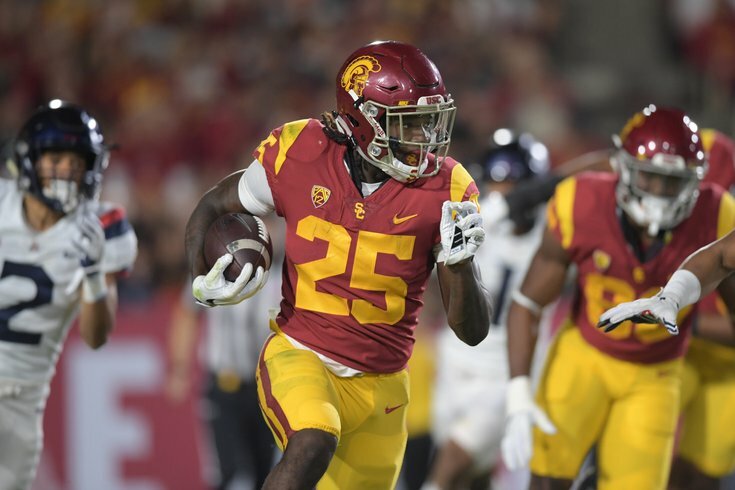 The USC standout missed out on a chance to show scouts that he deserves to be the second running back taken in the draft. Jones tweaked a hamstring during his first 40-yard dash that forced him to the sidelines for the rest of the day. With scouts questioning his hands and route-running skills due to his low catch numbers as a collegian, Jones needed to go through the pass-catching portion of the workout to establish himself as the top RB prospect not named Saquon Barkley. Really unfortunate circumstance here. If teams drop him because he tweaked his hamstring, than they're not good enough at evaluating film and should find different jobs. Still, if he's available at the end of the first round, I could see the Eagles having interest as a home run threat in their offense, whereas an impressive Combine might have pushed him up the draft boards of some teams. The Eagles don't need a center or guard in the short-term, as Jason Kelce, Brandon Brooks, and Stefen Wisniewski have those spots locked down, but the Eagles (and every other team) can always use additional offensive linemen. Any team drafting Price highly would have some level of expectation that he would start in 2018, but after suffering a partially torn pectoral muscle while doing the bench press, he'll likely drop out of the first round. If the Eagles are somehow able to add a second or third round pick, Price could be a first round talent that the Eagles wouldn't need to play immediately.